Reinforced by our extreme industry experience and knowledge, we are offering Transformer Connector to our valuable patrons. 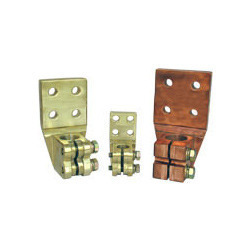 Offered connectors are designed by employing supreme-grade raw components and with the help of technology based machinery to meet industry norms. Our quality team tests all Transformer Connectors on predefined parameters of quality in order to offer defect-free variety. Established in 2000, R. S. Engineers is the entrepreneur and leading Manufacturer and Supplier of Transformer HV Metal Parts, Transformer LV Metal Parts, Transformer Connecting Lugs, Transformer Clamping Rings, Primary Terminals, Oil Level Indicators, Flexible Jumpers, Brass Bolts, Brass Nuts, Cable Glands, Brass Elbows, Brass Inserts, Plain Washers, Spring Washers, Tie Rods, Rubber Gaskets and Copper Bolts. Our products are high in demand in the market for their several industrial applications. We obtain complete satisfaction of our valuable customers by providing them market best products. Faith of the consumers and increasing products demands in the market make us to work with more dedication to deliver our best performance in manufactured products.